One of the most impressive things about Vienna is its public transportation system. Its streetcars, buses, and underground trains provide excellent coverage of the city, are usually clean, and, almost always, run on time. I like most aspects of the system, except one, which I will mention later. To encourage regular use of public transportation, the city uses both pricing and regulatory policies. As elsewhere, traveling by car in Vienna has great allure, and the number of automobiles in the city keeps growing, crowding the streets. To get people out of their cars, the city recently lowered the price of annual passes for the city's public transportation from 449 euros per year to 375. At the same time, it adjusted parking charges and regulations to make short-term parking in the central districts (1 to 9) more expensive and difficult for out-of-the-neighborhood drivers. While an area resident can buy an annual neighborhood parking permit (parkpickerl) for 120 euros (until March 1, it had cost 135 euros), he or she must pay one euro per 30 minutes to park in other central district locations and may park in such a location for a maximum of 2 hours. The price of public transportation in Vienna is structured so that visitors pay much more than residents for their travel. A single ticket for public transportation, entitling a person to use any bus, street car, or U-bahn within the city to get from point A to point B, costs 2 euros. Another ticket is required to get back. These individual tickets can be purchased from ATM-type ticket machines (with optional English instructions) that are available at every U-bahn stop and a few streetcar stops. The ticket machines accept credit cards for which you can provide a pin number. The Vienna transportation ticket machine. It has an English option. Locals, of course, rarely use these single tickets; they have options for weekly (15 euros), monthly (45 euros), and annual (375 euros) passes that greatly reduce the cost per trip. Most of these options are not attractive to visitors unless they are going to be in Vienna for an extended time. These passes cannot be bought from a ticket machine, but are purchased at one of the transportation offices located at major U-bahn stops such as Karlsplatz and the Westbahnhof stations. People without a valid Austrian picture i.d. need to carry a drivers license or passport with them when using one of the passes. Short-term visitors who plan to make several trips on public transportation can get a better price on their trips by purchasing a Vienna Card for 19.90 euros. This card provides unlimited access to public transportation for a 72 hours period, plus discounts to many city attractions such as museums. (It can be purchased from hotels and different tourist offices.) Another good option for some visitors is the 8-day "climate" ticket, which costs 33.80 euros (4.22 euros per day). This ticket gives unlimited access to public transportation within the city for any eight days that a rider chooses. These days do not need to be consecutive. On a day that the ticker holder will be making many trips by tram, bus, or U-bahn, he or she can validate the ticket on the first trip and travel on the city's public transportation during the rest of that day at no additional cost. If two or more people are traveling together, they can each use the same 8-day ticket, validating a day for each person. The use of Vienna's public transportation is simple. Back when I was a student in Vienna in 1967-68 and 1971-71, passengers had to enter each bus and tram at a designated door where the driver or a conductor checked and stamped his or her ticket. However, a long time ago the city moved to an honor system. 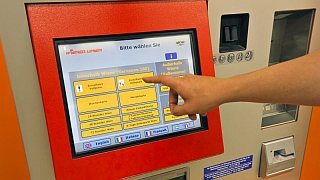 The buses, street cars, and U-bahn no longer have someone to check and validate tickets; you do it yourself. If taking the U-bahn, you validate a ticket using a machine at the entrance of the U-bahn station you are entering. When using a bus or street car, you can validate the ticket at small machines inside it. The main thing is that each passenger is responsible for having a valid pass or validated ticket for each use of public transportation. To insure that people are traveling with valid passes or proper tickets, the city has bands of roving inspectors that swoop into buses or trams and that check people exiting U-bahn stations to see if they have valid tickets or passes. Those that don't must pay a 100 euro fine. These inspections seem to be rare. As I recall, my ticket has been checked two times in the past twenty years of almost annual visits. During the past two years, when I used Vienna's public transportation almost daily for two months, I never saw an inspector. 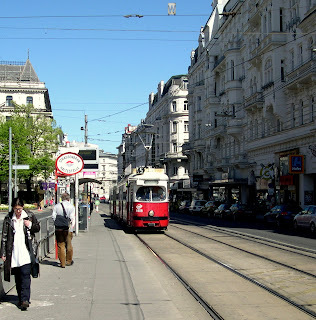 When choosing which form of public transportation to take in Vienna, I take a streetcar if I am not in a big hurry and want to sight see while traveling. I choose a bus if I don't want to dawdle; they are faster, but less enjoyable than streetcars. Finally, I take the U-bahn if I am in a hurry and one is within walking distance. They get to their stops quickly, though when crowded they sometimes are uncomfortable. During rush hours, U-bahn trains are usually crowded. 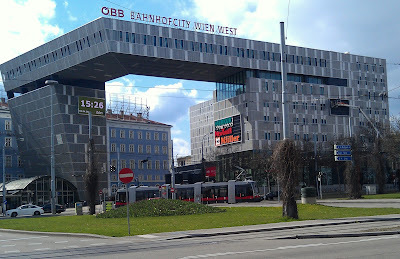 Another element of Vienna's public transportation system that impresses is its new links to the nation's rail system. 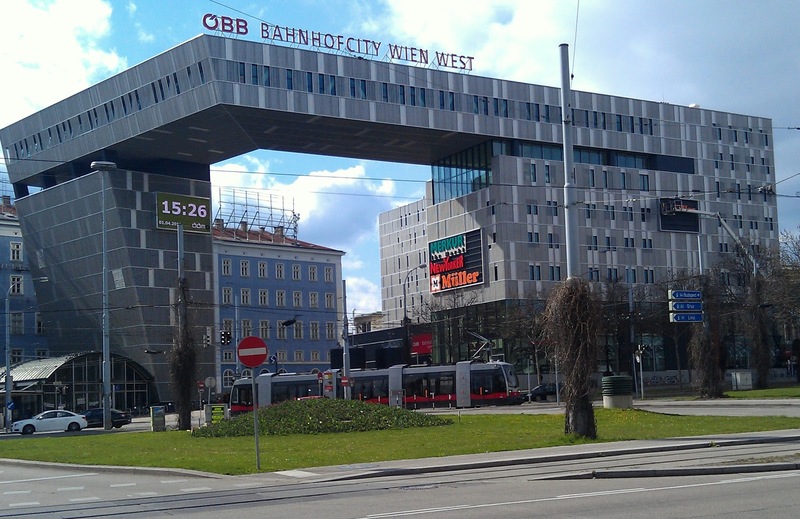 Among the most striking developments in Vienna in the past few years has been the reconstruction of the city's two main train stations, the West and South stations. The city has other smaller stations, but these two are by far the largest and are used by most international trains. 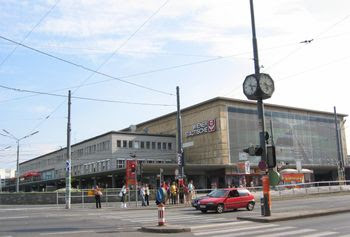 After several years of work and temporary displacement, the West Train Station (Westbahnhof), which lies where the major shopping street, Mariahilferstrasse, meets the Guertel, was recently reopened. Not only was the train station refurbished and brightened, but multi-story buildings were constructed on each end of it. One contains an office complex, the other has a major new hotel. Linking these three buildings, on the ground floor and basement, is an impressive shopping center. 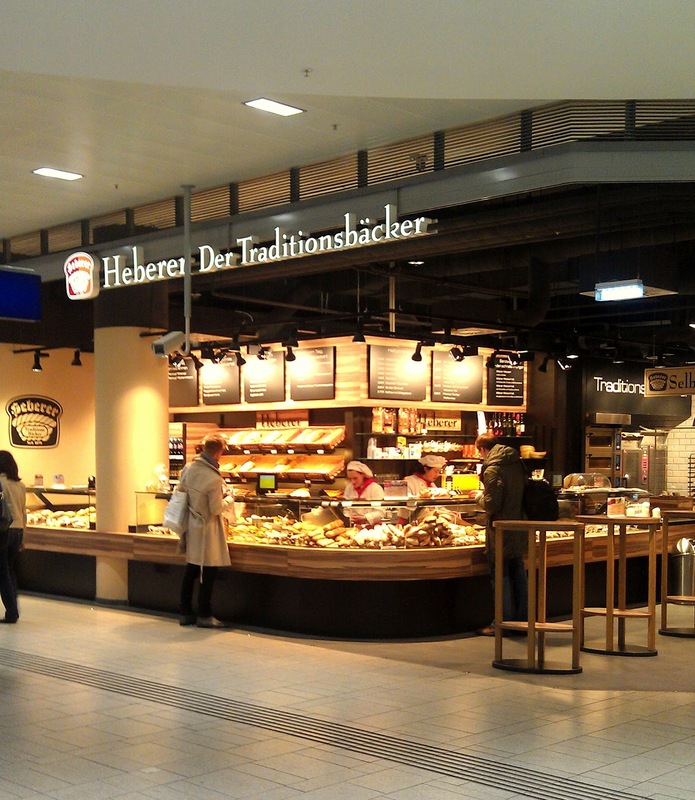 This center has large grocery, electronics, and general stores, plus several fashion stores, restaurants, bakeries, and small specialized shops. With the completion of this reconstruction project, the West Train Station has become a major shopping destination as well as an attractive entry way into the city. As work on the West Train Station was being finished, an even more ambitious project was underway at the South Train Station (Suedbahnhof). This project is taking several years and will cost a couple billion dollars. In December 2009, the South Train Station was closed and trains that used it were rerouted. Soon after that, the station was torn down and construction of a new station, located a quarter of a mile away near Suedtirolerplatz, began. 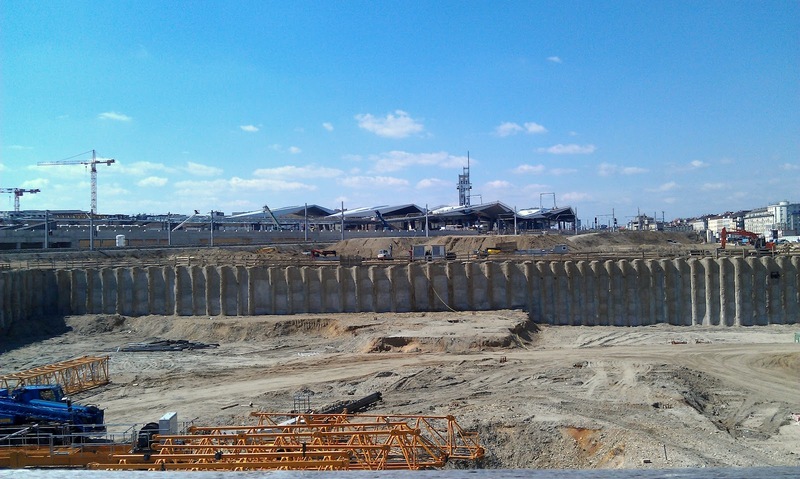 In April 2012, the results of this work are major parts of a modernistic new station, a huge hole in the ground, and obvious construction work between the two. 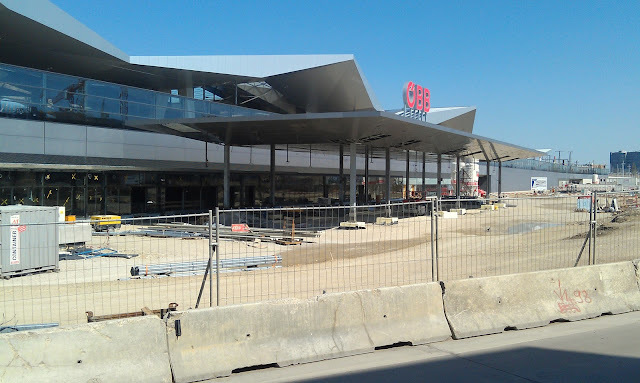 Much of the past two years was devoted to constructing roads to serve the new station and building new tracks that will take international trains through this new station, which will be called the Hauptbahnhof (Main Train Station). Plans are for the first train to go through the new station in August 2012, and after that, more trains will be using the new track. Parts of the new station should open in 2013. These huge, ambitious infrastructure projects have contributed to the economic growth of Vienna and they help position the city as an important link between west and east Europe in coming decades. They are grand in scale and should provide a continuing boast the country's economy for many years to come. (the new one is in the background). My final observation about the Vienna transportation system has to do with the one thing about it that I find substandard: the bus to and from the airport. I have been using this bus for many years; until the last two years, it met the high standards of the other forms of public transportation in Vienna. However, that has now changed. The problem starts at the airport. In the past, the buses parked curbside at the doors used by arriving passengers to exit the airport. The buses have moved: they now have boarding areas across a narrow street from the curb. In this location, the proper bus is a bit more difficult to find and the procedures for taking it are not transparent for most people who have not previously used them. The passenger is expected to deposit his/her luggage in the storage space under the proper bus, then stand in line to get into the bus. Unfortunately, there is not much space for a line to form; when it does form, it blocks access to the storage space. Often, the result is confusion and traveler anxiety. Unfortunately, no transportation employees are around the buses -- typically several buses are waiting to go to different locations -- to help confused travelers find the right bus and get on it. Certainly the drivers are of no help. 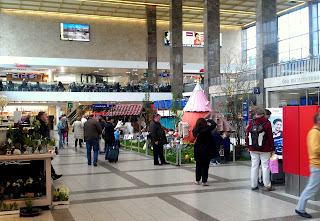 During my most recent trips to and from the airport, the following was typical: the driver waited until a few minutes before the scheduled departure to show up to open the bus, resulting in a long line waiting to get into it (the buses leave every 30 minutes; on busy days, a line starts forming soon after one bus has left and another has taken its place.) With people boarding the bus so near departure time, the bus did not leave on time because the driver was still taking payments from late boarding passengers. Of course, it was not apparent to most riders that the buses were starting late because the bus's clock near the rear-view mirror no longer works. The drivers have nothing to do with loading or unloading luggage (lower paid folks, apparently, have been hired to do that) and little apparent interest in passengers, though they certainly enjoy talking to each other. In my most recent bus trips, the drivers have turned on the radio to listen to their favorite station, which some passengers near the front might find annoying. (I have never heard a radio in any other Vienna bus, street car, or subway train.) On my last trip from the Westbahnhof to the airport, which was so overcrowded that people were standing in the aisles, the driver made an unscheduled stop at which some guy came on the bus to take something from the driver and to give him a package. Who knows what is going on with the airport bus service? It certainly is not up to the standards of other transportation in Vienna. The good news is that the plans for the new Hauptbahnhof include a train that goes to and from from the airport. Something to look forward to in 2016 or so. One final comment on a new development in Vienna transportation. 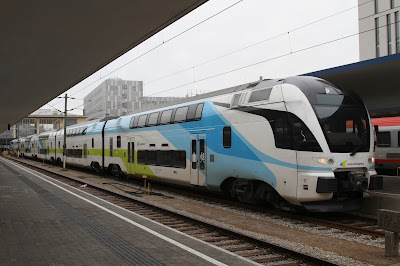 Travelers who want to go to from Vienna to Salzburg (or five cities in between them, including Linz) have an alternative to the country's national train system, the Oesterreichische Bundesbahn (OeBB). 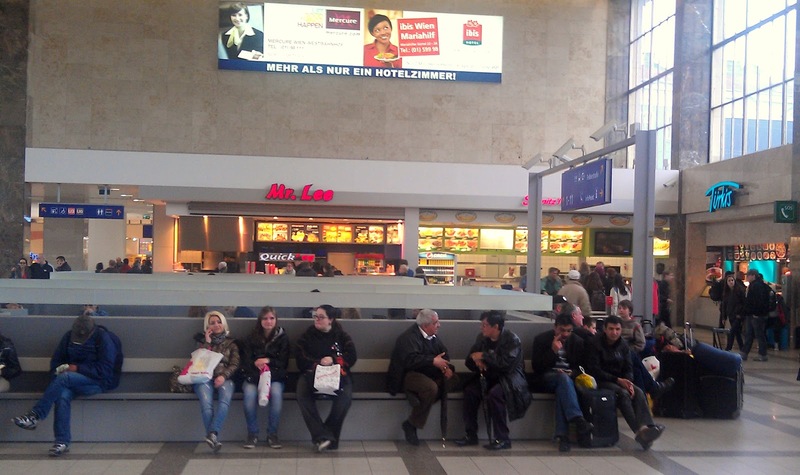 A new private company, Westbahn, offers train travel between these two cities twelve times a day, departing from and arriving at the West Train Station. Westbahn's walk-on week-day ticket price (at present 23.80 euros) beats the standard fare of OeBB, though the OeBB may sell similarly priced discounted tickets a couple of weeks in advance for a specific day and time of departure. The private train's weekend price is a real bargain. 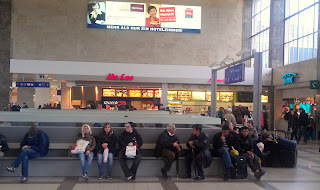 For example, in April, I paid 7 euros for a Saturday trip on Westbahn from Salzburg to Vienna. Because travelers can get good prices without advance purchase and pay for the trip while on the train, Westbahn seems well-suited for tourists who want to travel between Austria's two largest cities. The price of a single one-way public transportation trip in Vienna's Zone 1 has been increased from 2.00 to 2.60 Euros and the cost of the 8-day ticket has risen from 33.80 to 35.80 Euro. Great and informative article about public transport in Vienna. I've got just one quibble. You make it sound as if the bus was the only way to reach the airport right now and a train connection will only be established in 2016 but there are already two trains that connect the city center with the airport right now. There's the City-Airport-Train (CAT) that is a bit faster and lets you do your check-in at the terminal on Wien-Mitte train station but is expensive and considered to be a rip-off by most locals, and there's the regular commuter train S7 that also stops at Wien-Mitte every half hour and takes you to the airport in a about 25 minutes. Most locals use this connection as the regular public transport tickets are valid on this train. Maybe that's the reason why the bus is substandard (never used it myself), because it's considered a secondary option, at best. You are absolutely correct about the alternatives to using the Airport bus to get to and from the city. Thanks for pointing out my omission and providing information on a better way to get from the airport to the city and back. Like you, I often take the S7 Express Train that also stops at Wien-Mitte, but also goes on to the Swedenplatz U-Bahn station and beyond. It is certainly slower than CAT (about 25 minutes for the trip), but the price is much cheaper: two single one-way transportation tickets. These can be purchased at the ticket machines at the airport for 2.20 Euro each. With these tickets, a traveler can exit at one stop, such as Wien-Mitte, and continue on another subway, Strassenbahn, or bus to a final stop near his/her destination. If a traveler is unfamiliar with the commuter train option, you can find the train when you arrive at the Vienna Airport by following the plentiful signs directing you to the CAT. Walking along the corridor to that train, you will spot the stairs down to the S7 Express Train. 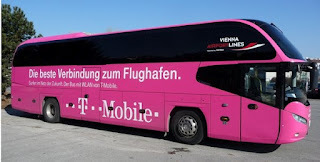 I have used the airport bus option several times because my ultimate destination was near the Vienna West Train Station and bus provided the most convenient way to get there without lugging suitcases on and off trains,subway cars, buses, and/or street cars. The airport bus also offers a quick and convenient option to get to the Schwedenplatz area without messing with luggage. Unfortunately, the cost of a trip has increased again and now a one-way trip is 8 Euros. Thanks again for your comments and suggestion. I'm looking forward to another month-long stay in Vienna starting this April. This time, I doubt I use the Airport bus.